It's lovely outside, isn't it? August evenings are perfect for a little dinner al fresco and the music that accompanies it should be just as light and airy. 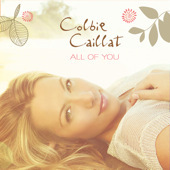 Colbie Caillat's latest release "All of You" is like a cool beachy breeze. Listen now then when you're bundled up inside this winter you'll remember what it was like to feel the sunshine on your shoulders.